GWANGJU – The government on Friday promised to delve further into the 1980 Gwangju movement on the 38th anniversary of the May 18 Democratization Movement. The commemoration event took place under a rainy sky, with thousands gathered at the May 18 National Cemetery commemorate the movement that was met by a brutal crackdown by the government. 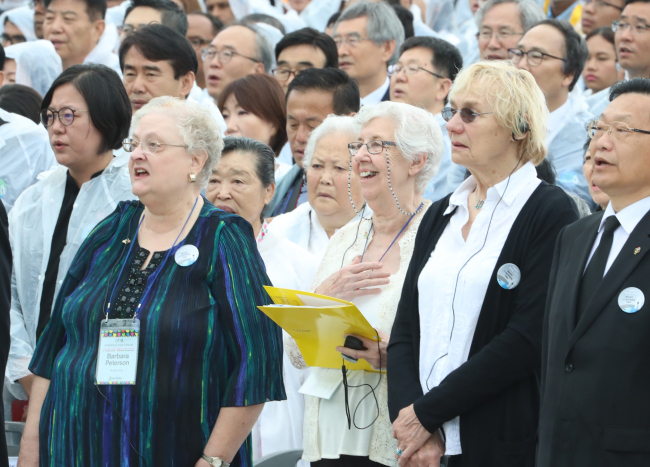 From surviving victims and bereaved families to ministers and political leaders of rival parties, they all stood in white raincoats and held each others’ hands to sing “March for the Beloved,” a song dedicated to the sacrifices of Gwangju citizens during the May 18 Democratization Movement. President Moon Jae-in, who has vowed to “stand in line” with the legacy of the pro-democracy spirit of the city, renewed his pledge on Friday, and also addressed the sexual assault cases during the uprising that has recently been disclosed. “Today, I solemnly commemorate those killed in Gwangju and look back on the tears of many citizens who did not hold back to defend the values of democracy,” Moon said in a statement, as he was not able to participate in the 38th anniversary event. Bringing attention to the stories of sexual abuse that occurred to women at the time, he said ministries of defense, gender equality and the National Human Rights Commission will form a joint investigation team to look into alleged cases. 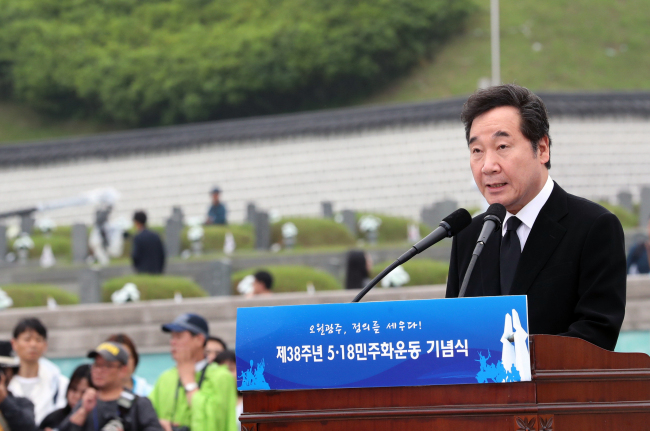 At the national cemetery, Prime Minister Lee Nak-yon spoke to the audience on behalf of Moon, and reiterated the government will make sincere efforts for fact-finding missions. “While 38 years has passed since the pro-democracy movement, we still have tasks left in front of us. The first is to find the truth,” Lee said. In the May 18 Democratization Movement 1980, citizens protested against the military dictatorship of Gen. Chun Doo-hwan, who took power through a military coup and enforced martial law throughout the country. During the nine-day protest, more than 200,000 Gwangju citizens took to the streets and hundreds were killed and wounded as Chun ordered the most violent crackdown in the nation’s modern history. But due to the concealing attempts of the administration at the time, information about the brutal attacks on civilians were largely concealed. The military junta also fanned negative sentiments about the movement, claiming that the events of Gwangju were instigated by North Korean agents. Watching the performance which re-enacted the story of Lee Gui-bok, a father who tried to find his son he lost during the protest, many participants shed tears of sympathy. While feeling sorrow, many raised hope that things will finally change, under the liberal administration. Jung Seon-ja, a mother who lost her two young sons, also praised the Moon administration as to be doing what should have done years before. “I heard that (the military) had infants and children who were killed in the massacre were all buried on Baekasan, a mountain on way to Hwasoon in South Jeolla Province. I want to ask President Moon and the prime minister to install cable cars for families to visit,” Jeong Sam-rye, 89, told The Korea Herald. With the Special Act on the May 18 Democratization Movement enacted in March 13, the Ministry of National Defense is preparing to launch a special fact-finding committee in September. In February, the first-ever apology came from the Defense Ministry for the military’s bloody crackdown in the May 18 movement. “As the minister of national defense, I offer a sincere apology and (words of) comfort to Gwangju citizens that our military has left suffering in the process of the May 18 Democratization Movement 38 years ago,” Defense Minister Song Young-moo said in a statement. At the event, the wives of foreign missionaries and a journalist who have witnessed and tried to spread the brutalities occurring here to the world, were also present. Edeltraut Brahmstaedt, wife of late German journalist Jurgen Hinzpeter and Barbara Peterson, the wife of pastor Arnold Peterson sat next to each other in the front row of the crowd. Martha Huntley, the wife of late Charles Betts Huntley who was a pastor of Kwangju Christian Hospital, read to the audience her letter expressing condolences and love to the Gwangju citizens. "The cruelty I witnessed in Gwangju could not be expressed in any words. But the love the citizens of Gwangju showed us was greater than anyone can imagine," she said. Peterson also told The Korea Herald that she is grateful for the changes that has been made in South Korea since the May uprising in 1980. "Now you elect your own president, and that is what the students have been fighting for, in the first place," she said.